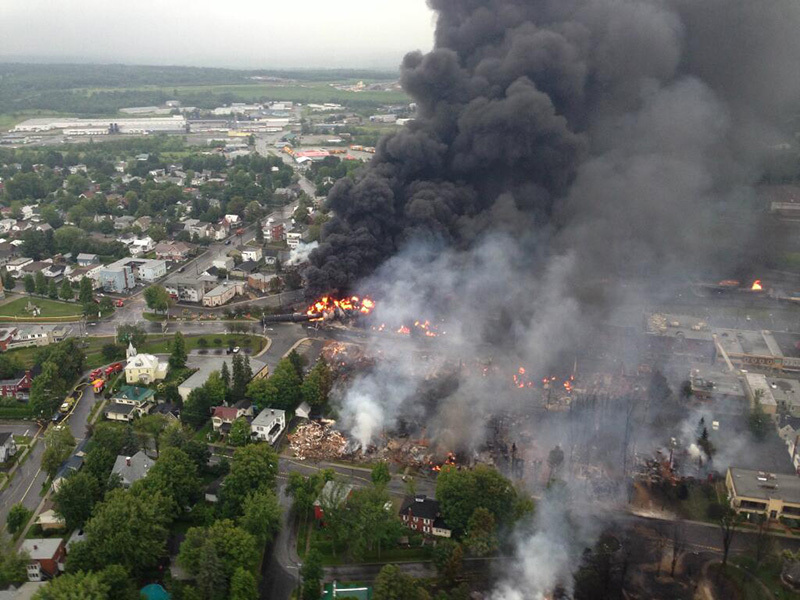 The aftermath of the derailment of a train carrying Bakken crude oil, in the Quebec town of Lac-Mégantic on July 6, 2013. 47 people were killed. Read: Remembering Lac-Mégantic. 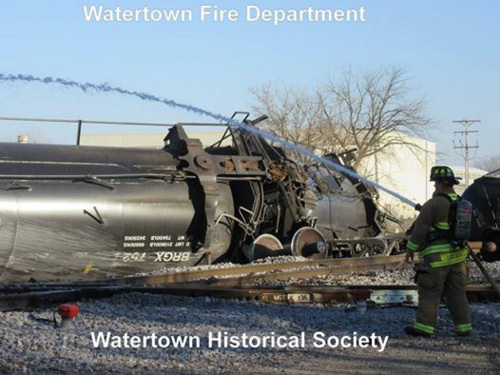 Click on to see some recent oil train accidents and for communities fighting for protections. 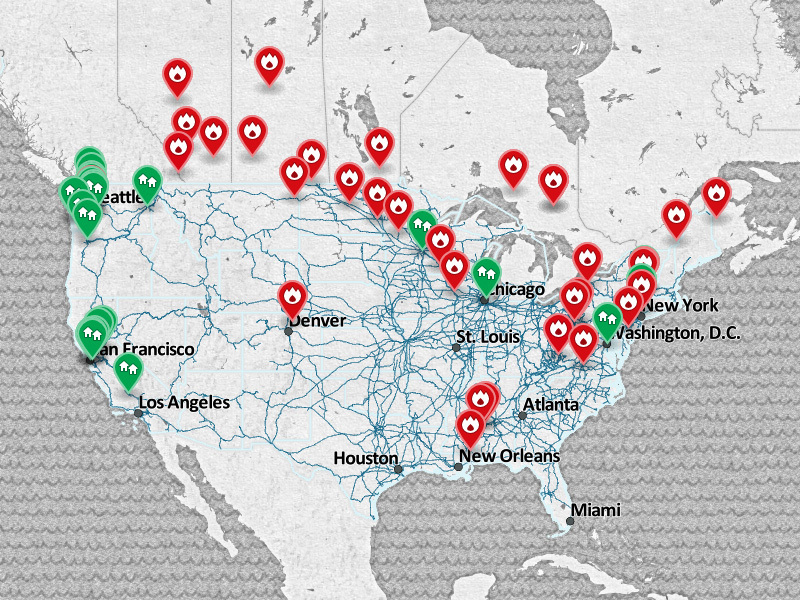 Blue lines indicate U.S. major freight rail lines. 32 cars derail south of Doon and north of Rock Valley, spilling an estimated 230,000 gallons of crude oil into floodwaters of the Little Rock River. The Shell Puget Sound Refinery announces it is dropping its plans to construct a crude-by-rail facility. Originally proposed in 2014, community opposition and legal challenges forced Shell and Skagit County to undertake a full environmental and public health review under the State Environmental Policy Act. That delay, growing local and regional opposition, and uncertain economics contributed to Shell’s decision. At least eight cars were involved. Flames from the resulting fire could be seen from the downtown area of nearby Mosier. The smoke plume was visible for miles. Portions of I-84 were shut down. A nearby school was evacuated. The County of Albany, a tenants association, and several environmental groups, represented by Earthjustice, file a lawsuit in federal court charging that the major crude-by-rail conglomerate Global Companies is operating in violation of the Clean Air Act. One of the three companies proposing crude oil shipping terminals in Grays Harbor said it will abandon its plans to handle crude oil in comments submitted to state and local agencies. Groups say they will continue to closely monitor the company’s planned expansion of its existing terminal. A Canadian Pacific train carrying 109 cars of Bakken crude oil derails near the downtown area of Watertown, while en route to Pennsylvania. One of the 13 train cars is punctured, spilling hundreds of gallons of crude oil. Dozens of homes were evacuated overnight. A BNSF train carrying 106 cars of crude oil traveling from North Dakota to Anacortes, Washington, derails near Culbertson. An estimated 35,000 gallons of crude spills. An evacuation order was issued for people within a half-mile radius. No injuries or explosions were reported. 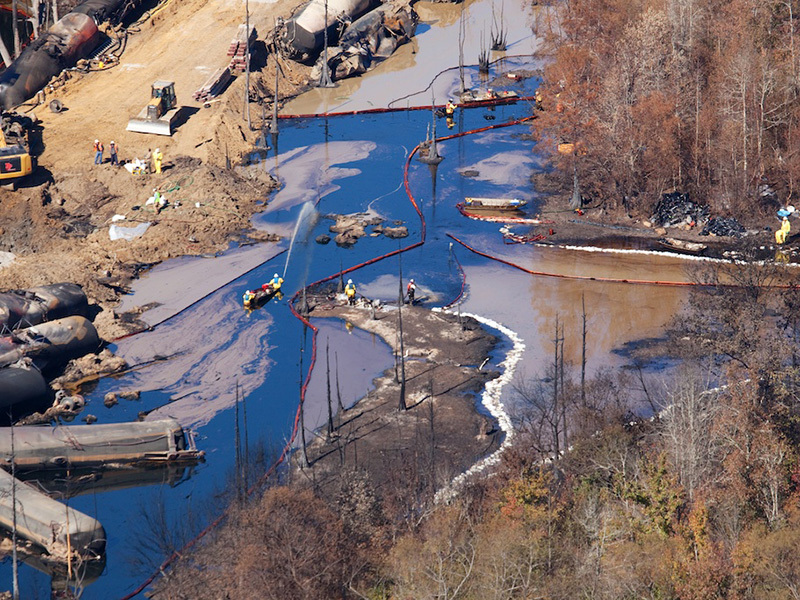 A federal judge dismisses a legal challenge to a California law that requires railroads to commit to oil spill response plans and demonstrate financial solvency in efforts to reasonably prepare for the risk of oil car derailments and disasters. Earthjustice, representing a broad coalition, joined in the State of California’s defense of the law. Municipalities, Waterkeeper groups, and conservation organizations file an administrative appeal over the U.S. Department of Transportation's emergency responder and public notification provisions in the DOT’s Oil Tank Car Safety Rule. Skagit County Superior Court dismisses Shell Oil Refinery’s appeal of a decision that required an environmental impact statement for their proposed oil-by-rail expansion. The decision follows the Skagit County Hearing Examiner’s February 2015 ruling that Shell’s proposed project posed a significant risk of harm to people, water and wildlife. Earthjustice represented local and state groups. In the face of a court challenge from a broad coalition of environmental and community groups and massive community opposition, the Department of Environmental Conservation halted Global Companies’ proposed expansion of its massive Albany oil train facility to handle tar sands oil. The new safety standards issued by the Department of Transportation take too long to get dangerous tank cars off the tracks and contain loopholes that leave too many vulnerable. Earthjustice has filed suit in the 9th Circuit challenging the rule on behalf of ForestEthics, Sierra Club, Waterkeeper Alliance, Washington Environmental Council, Friends of the Columbia Gorge, Spokane Riverkeeper, and the Center for Biological Diversity. 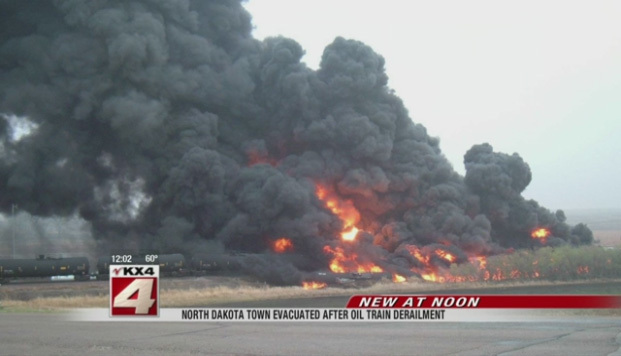 A BNSF train with 107 cars carrying crude oil derails in central North Dakota. Five to ten cars reportedly explode and burst into flames. The nearby town of Heimdal and surrounding farmsteads are evacuated. 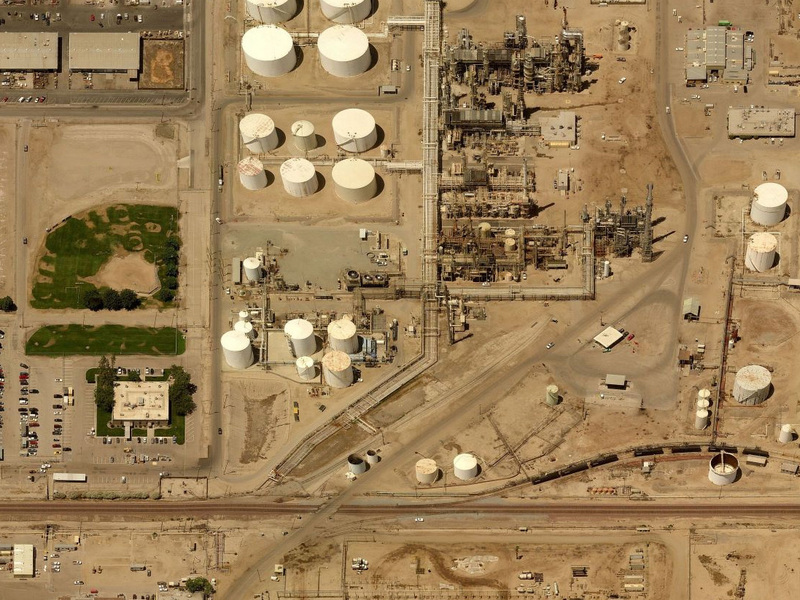 EPA cites the Bakersfield Crude Terminal for 10 violations of the Clean Air Act. A 94-car CN train carrying Alberta crude to eastern Canada derails near Gogama. Numerous cars catch fire. 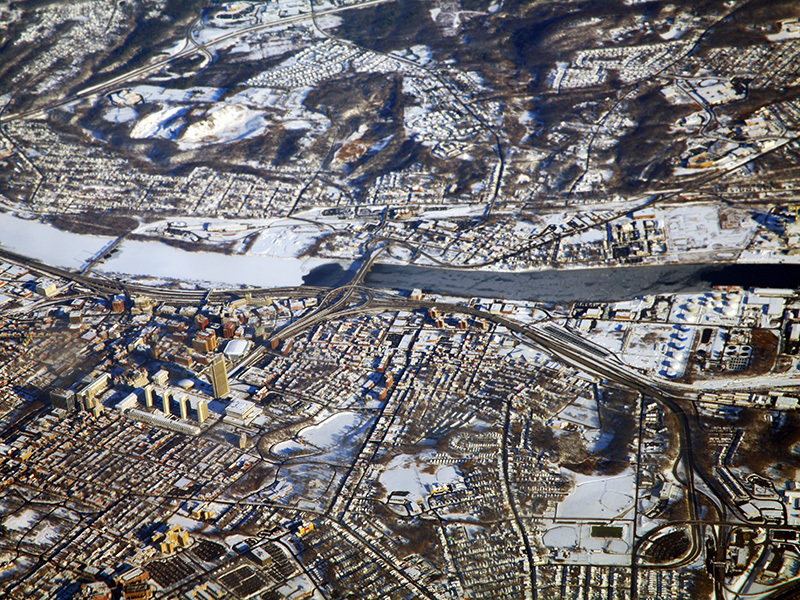 Oil spills into the Mattagami River System, which is used for fishing and drinking. A BNSF train carrying 103 cars filled with Bakken crude oil derails south of Galena, near the Mississippi River, resulting in thick plumes of smoke and fires that burned for days. River protection, conservation, and neighborhood groups move to become parties in proceedings that will decide the future of the proposed Tesoro-Savage crude-by-rail terminal. The facility would be the largest oil terminal on the West Coast. A CSX train carrying 100+ cars of Bakken crude oil derails near Mount Carbon. Nearly 20 cars ignite, resulting in explosions and plumes of thick black smoke. Fires burn for days. One home was destroyed, and one car falls into Kanawha River. Drinking water intake pumps serving nearby Montgomery are closed. A U.S.-bound Canadian Pacific train carrying Alberta tar sands derails near Frank. No oil is reported spilled. 29 cars of a 100+ tank car Canadian National train carrying Alberta tar sands derails. Seven cars ignite, burning for days. Groups, represented by Earthjustice, file suit over the expansion—orchestrated mostly in secret—of a crude oil operation at the Bakersfield Crude Terminal that could lead to a 1,000% increase in the amount of crude imported by rail into California each year. Earthjustice, on behalf of Sierra Club and ForestEthics, challenges the Department of Transportation’s denial in November of the groups’ petition for an immediate ban on the most hazardous DOT-111 rail tank cars carrying explosive Bakken crude oil. A month after Earthjustice filed a lawsuit on behalf of Sierra Club challenging the Sacramento air district for rubber-stamping permits allowing Inter-State Oil Company to transfer Bakken crude oil from rail to truck without public or environmental review, the agency reversed course telling the oil company to cease all crude trans-loading operations. 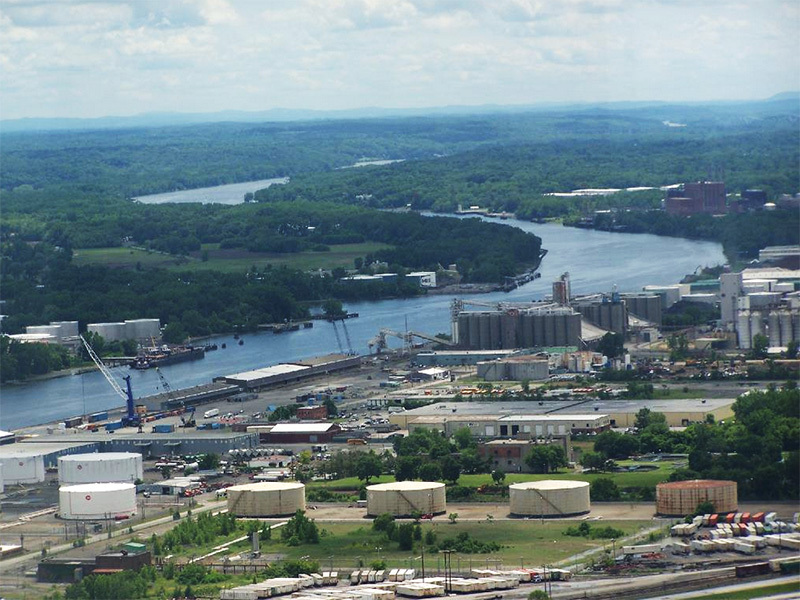 A coalition of local residents and environmental groups file a legal petition requesting the DEC Commissioner to issue an order prohibiting the receipt and storage of explosive Bakken crude oil in outdated and dangerous DOT-111 tank cars at the Port of Albany. Aerial image ©2014 Microsoft Corporation / ©2012 Pictometry International Corp.
A coalition, represented by Earthjustice, files a lawsuit against the Kern County Board of Supervisors challenging its approval of the massive Alon Bakersfield Refinery Crude Flexibility Project. Aberdeen City Council passes a strongly worded resolution opposing plans to transport crude oil through Grays Harbor. 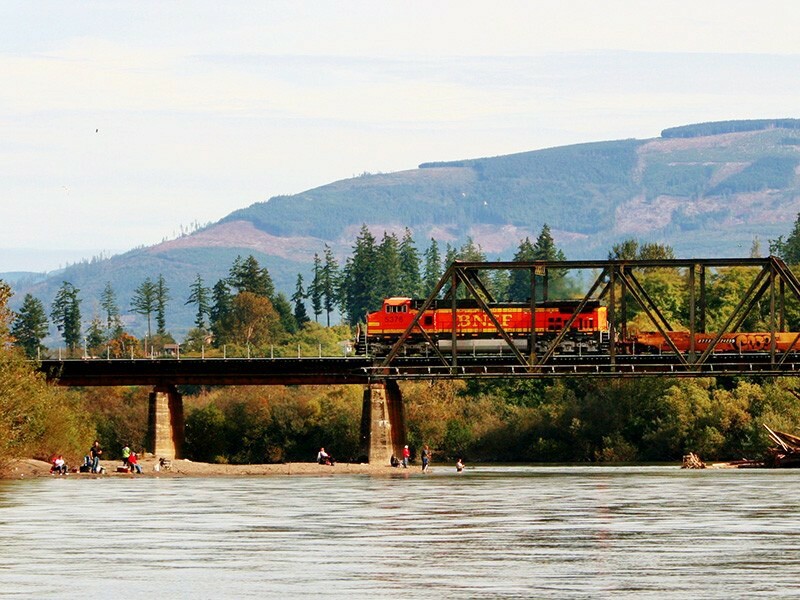 The resolution has no force of law, but it sends the message that the city opposes the plan to bring long oil trains into the community, store the oil at three Hoquiam tank farms and ship it out on tankers and barges. Chicago City Council approves a resolution calling on the federal government to impose more stringent restrictions on the shipments of crude oil by train. The Bainbridge City Council unanimously approves a resolution calling for stronger regulations, more impact assessments and a statewide pause on projects that promote oil train expansion. A BNSF train carrying Bakken crude from North Dakota derails at the Interbay rail yard in Seattle. The tankers held 27,000 gallons of crude. No spills were reported. Conservation groups, represented by Earthjustice, file a lawsuit charging Global Partners LP with trying to skirt Clean Air Act protections while converting an ethanol facility into a high-volume Columbia River shipping terminal for extremely volatile crude oil. Two Canadian National Railway DOT-111 tankers carrying crude derail in the Symington Rail Yard in Winnipeg. No injuries or leaks reported. 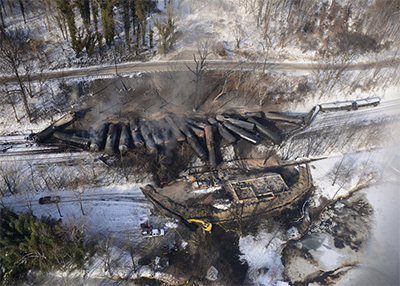 The Kent City Council approves a resolution calling for steps from state and federal agencies to protect local residents from potential derailments of crude oil rail traffic. The Edmonds City Council passes a resolution expressing concern about the impacts of increased rail traffic. Oakland City Council unanimously passes a resolution that opposes transportation of hazardous fossil fuel materials, including crude oil, coal and petroleum coke, along waterways and through densely populated areas. Mukelito City Council unanimously passes a resolution calling for strengthened federal and state safety regulations of crude oil rail traffic. Seven oil tankers derail and crash near Buhl, forcing a mandatory evacuation of the area. No spills or injuries reported. A CSX train derails over the Youghiogheny River in McKeesport. Twelve cars are involved, including one containing light crude. No spills are reported. 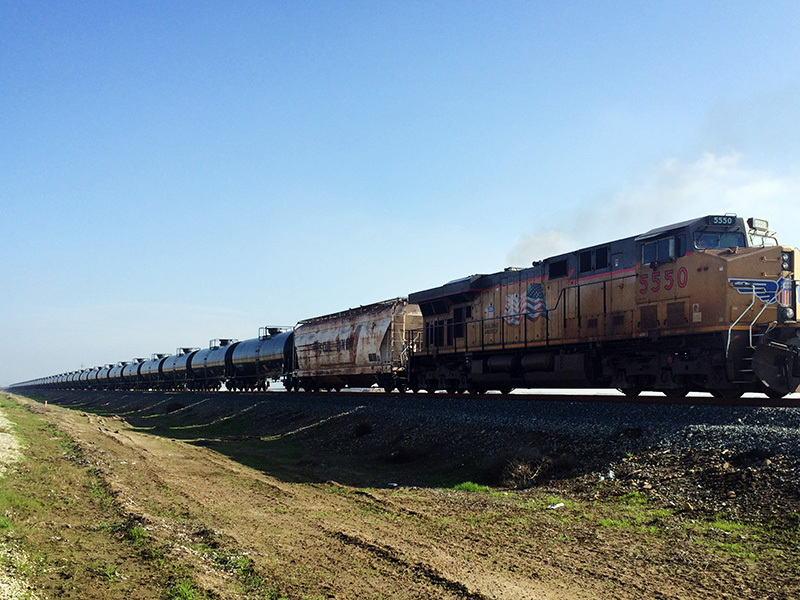 The Legislature passes a measure bringing increase scrutiny to crude oil trains and pipelines. 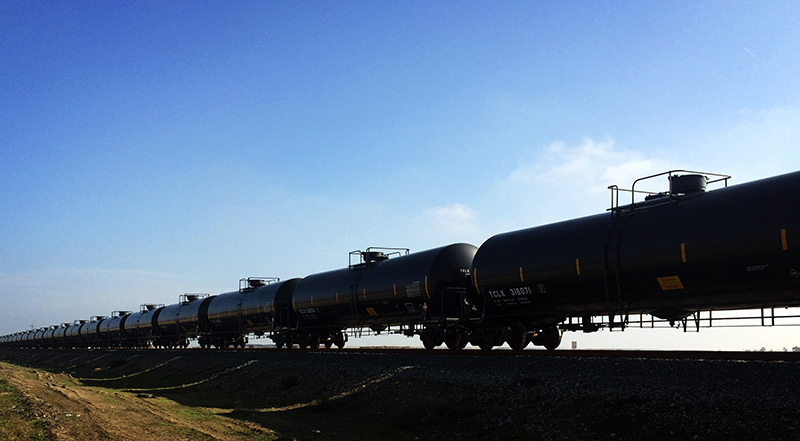 About eight 100-car oil trains, carrying North Dakota crude, run through Minnesota cities each day. Four Canadian Pacific Railway tankers carrying Bakken crude derail in the Kenwood Rail Yard in Albany. No spills are reported. A Union Pacific 100-car train en route to New York derails near LaSalle, spilling 5,300 gallons of Niobrara crude. Months later, groundwater tests conducted by the EPA show toxic levels of benzene at the site. Four Canadian Pacific tankers carrying crude derail near Estevan. No spills are reported. A CSX train carrying crude oil derails in Lynchburg, setting off a 200-foot high fireball and prompting the evacuation of some 300 people. 30,000 gallons are spilled, including into the nearby James River. Thirteen CSX DOT-111 crude tankers derail at the Selkirk Rail Yard in Albany. No spills or injuries reported. The derailment occurred the same day the state government touted an "inspection blitz" of oil trains that was conducted the previous week. 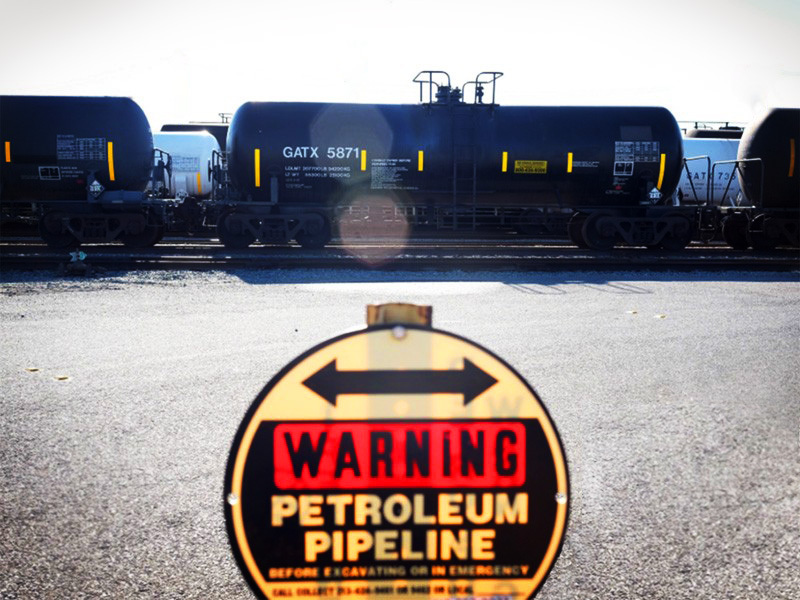 Davis City Council passes a resolution opposing the use of existing Union Pacific rail lines to transport hazardous crude oil through the City of Davis and adjacent habitat areas. Auburn City Council unanimously passes a resolution seeking to protect the health and safety of local citizens and drinking water supplies from crude oil rail traffic. Berkeley's City Council votes unanimously to oppose oil company Phillips 66’s plans to transport crude oil through their city to a new refinery in nearby San Luis Obispo County. Seattle City Council unanimously passes a resolution urging the governor and other state regulators to refrain from issuing permits for projects that would increase oil transport until safety, environmental and economic concerns are addressed. A Norfolk Southern train carrying heavy Canadian crude crashes into a track-side building in Vandergrift, derailing and spilling 3,000–4,000 gallons. Spokane City Council unanimously approves a resolution calling for state and federal officials to scrutinize oil shipments via rail, including disclosure of routes and type and volume of oil. A Canadian Pacific Railway train leaks 12,000 gallons of crude along 68 miles of tracks near Winona. The spill is reportedly due to a valve or cap mishap. Thirteen cars of a Canadian National Railway train transporting North Alberta crude derails near New Augusta. 90,000 gallons of product were spilled and a dozen nearby homes were evacuated. 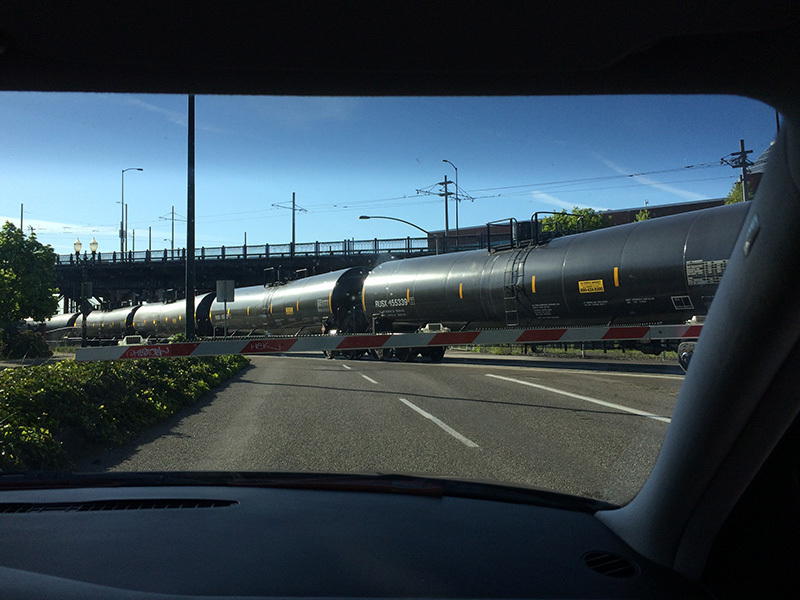 Bellingham City Council passes a resolution calling for better federal regulation of crude-by-rail shipments. A CSX train carrying crude oil derails on the Schuylkill Arsenal Railroad Bridge in Philadelphia, causing the closure of a nearby busy expressway. No crude oil was spilled. A Canadian National Railway train with DOT-111 cars carrying Western Canadian crude derails near Plaster Rock, sparking a large fire. 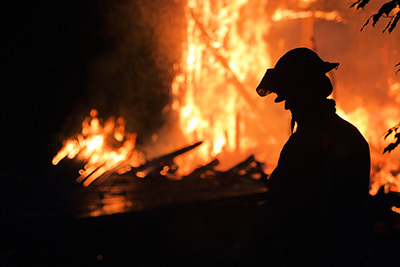 Approximately 150 people are evacuated from their homes for three nights. No injuries reported. 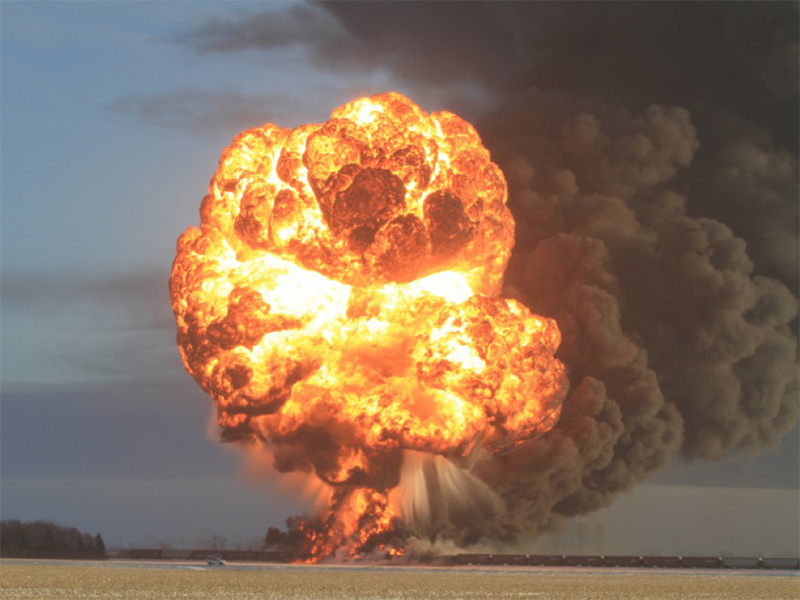 A BNSF Railway crude train crashes into another train near Casselton, causing a massive explosion and leading to the evacuation of 1,400 nearby residents. An estimated 400,000 gallons of crude are spilled. Dec. 11, 2013 Illinois: DOT-111 declared "public nuisance"
Chicago aldermen Edward Burke (14th) and Matthew O'Shea (19th) propose that the City Council declare the DOT-111 tank cars a "public nuisance" and ban them from the city. Five CSX oil tankers derail near Cheektowaga. The train was en route to Philadelphia from Chicago. No injuries or spills reported. A CSX oil tanker collides with a truck at a railway crossing near West Nyack. Both burst into flames. The driver of the truck was seriously injured. No spills reported. 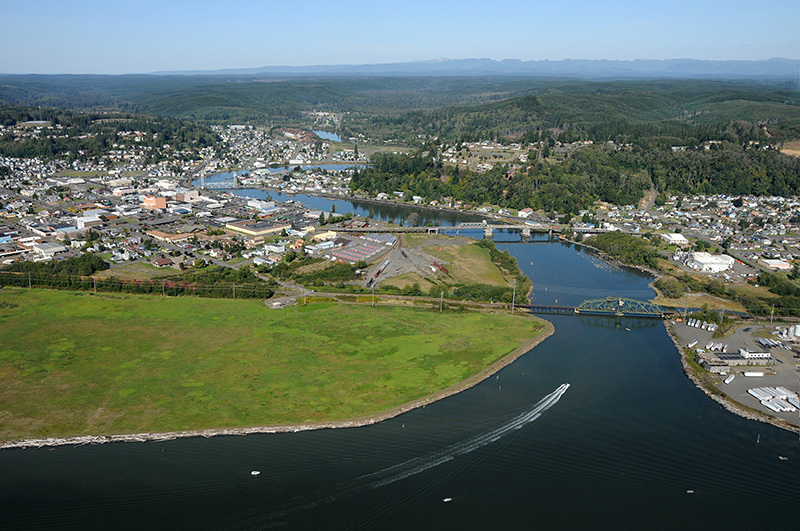 The Washington Shorelines Hearings Board reversed permits for two proposed Grays Harbor crude oil export terminals for failure to address significant public safety and environmental issues. Earthjustice represents the Quinault Indian Nation in its efforts to block the projects due to their threats to cultural and environmental values. 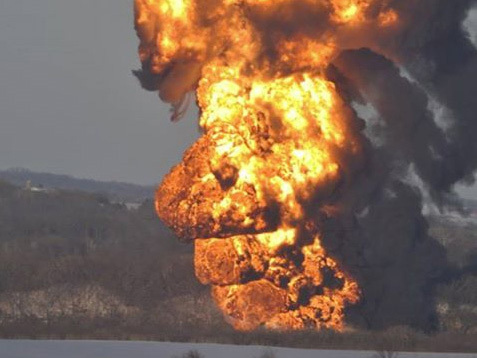 A Genesee & Wyoming train carrying North Dakota crude derails near Aliceville, exploding and burning for more than 18 hours. About 748,800 gallons are thought to have spilled, including into surrounding wetlands. Four months later, oil was still oozing into the water. A Canadian National Railway train carrying crude and propane derails near Edmonton. No crude was spilled, but an explosion and fire resulted from leaked propane. About 100 nearby residents were evacuated and a major highway was closed. 47 people are killed and nearly the entire downtown area is destroyed, when a runaway Montreal, Maine and Atlantic Railway train derails, spilling 1.6 million gallons of crude oil and exploding in the tiny town of 6,000 residents. A Canadian Pacific Rail freight train carrying petroleum distillates derails near Calgary after a bridge fails. Emergency personnel rushed to save train from falling into river. No injuries or spills reported. A Canadian Pacific Rail mixed freight train derails near Jansen, spilling an estimated 24,000 gallons of crude. A Canadian Pacific Rail train derails near White River, spilling an estimated 16,500 gallons of light sweet crude. 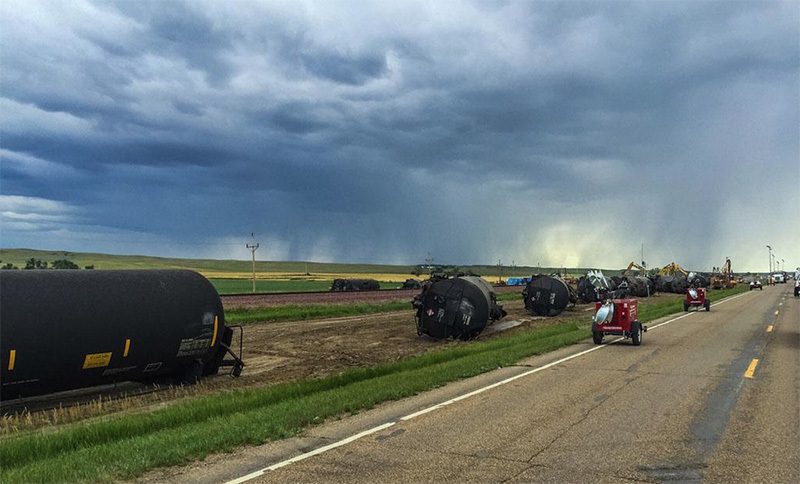 A mile-long Canadian Pacific train carrying crude oil from Canada derails near Parkers Prairie. An estimated 20,000–30,000 gallons is spilled. A CN Rail train collides with a road grader and derails near Paynton. An estimated 28,000 gallons of crude is spilled from four cars. One death resulted from the collision. A Canadian Pacific freight train collides with a crude oil tanker near Tilley, resulting in a fire that engulfs the tanker and locomotives. Q. What are DOT-111 and CPC-1232? DOT-111 tank cars have been in service in North America for several decades and were designed to carry liquids such as corn syrup. When involved in derailments, these tank cars are prone to puncture and spill their contents. As crude production in the United States has surged exponentially in recent years, these outdated rail cars have been used to transport the crude oil throughout the country. When these tank cars are involved in accidents while carrying highly volatile and toxic liquids such as crude oil, they have high tendency to spill oil and explode. The U.S. and Canadian official accident investigators recognized decades ago that the DOT-111s were unsafe for carrying hazardous materials, finding that the chance of a “breach” (i.e., loss of contents, potentially leading to an explosion) is over 50% in some derailment scenarios. U.S. and Canadian safety investigators have repeatedly found that DOT-111s are unsafe and recommended that they not be used for explosive or hazardous materials, including crude oil. CPC-1232s were developed by industry in response to the clear threats posed by the DOT-111s, and at best they represent a modest safety improvement. However, a large number of recent catastrophic crashes have involved CPC-1232s, and it is now well recognized that they are not an adequate response to the risks of shipping crude by rail. Bakken crude refers to oil from the Bakken shale formation, located primarily in North Dakota, where oil production has skyrocketed in recent years due to the availability of newer hydraulic fracturing (“fracking”) techniques. The increase in the nation’s output of crude oil in 2013, mostly attributable to Bakken production, was the largest in the nation’s history. Bakken crude is highly flammable, much more so than some crude oils. Today, Bakken crude moves in “unit trains” of up to 120 rail cars all carrying oil, as long as a mile and a half, often made up of unsafe DOT-111s and CPC-1232s. Q. Have there been accidents involving these trains? Yes. At this point, derailments of tank cars carrying crude oil have become almost commonplace. Since the surge in Bakken production began, there have been a number of high profile derailments of DOT-111s and CPC-1232s carrying Bakken crude that have led to massive oil spills, catastrophic explosions, evacuations, and significant casualties. In fact, just a few days after the DOT issued its final rule, a derailment in North Dakota of a 107-car train of CPC-1232s resulted in a huge fire and the evacuation of the nearby town. It was the 24th such derailment since the tragic accident in the small Canadian town of Lac-Mégantic, where 60 tank cars derailed and caught fire, killing 47 people. Given the extraordinary volume of Bakken crude currently being transported in unsafe rail cars, it is only a matter of time before another disaster of this magnitude—or worse—occurs. Q. What steps have the U.S. and Canadian governments taken? Safety experts in the U.S. government have repeatedly sounded the alarm that Bakken crude oil should not be shipped in DOT-111 tank cars due to the risks. Yet prior to the issuance of the new rules, all DOT did was issue safety alerts recommending—but not requiring—shippers to use the safest tank cars in their fleets for shipments of Bakken crude and to avoid using DOT-111 cars. After CPC-1232s breached, spilled oil and exploded in several rail accidents in 2014 and 2015, the investigators extended their recommendations to CPC-1232s. In the new tank car rule and a similar Canadian rule, new tank car standards will replace both DOT-111s and CPC-1232s for newly built tank cars. However, for existing tank cars, both countries have settled for weaker standards that require only that modest additional safety features be added to the CPC-1232 cars. Q. What are the other problems with the rule? The rule only applies to trains with 35 oil tank cars or more: Bakken crude can be transported in unsafe tank cars as long as there are no more than 34 cars in the train—forever. While the rule establishes a fairly robust standard for new tank cars, it allows existing cars to be held to a significantly weaker standard, exposing the public to excessive risk. The rule establishes a 40 mile per hour speed limit for only a small number of urban areas, but doesn’t offer this important protection to most populated areas near railroad tracks, rural communities, drinking water supplies, or other sensitive environments. The rule actually weakens standards for notice to emergency responders and the public that have been in place for the last year, meaning responders and communities will have even less information about the risks from crude oil transportation. Earthjustice has filed a lawsuit in the U.S. Ninth Circuit Court of Appeals, challenging the new tank car rule on behalf of ForestEthics, Sierra Club, Waterkeeper Alliance, Washington Environmental Council, Friends of the Columbia Gorge, Spokane Riverkeeper, and the Center for Biological Diversity. A group of local governments have also filed a challenge, and the American Petroleum Institute has brought a lawsuit of their own. 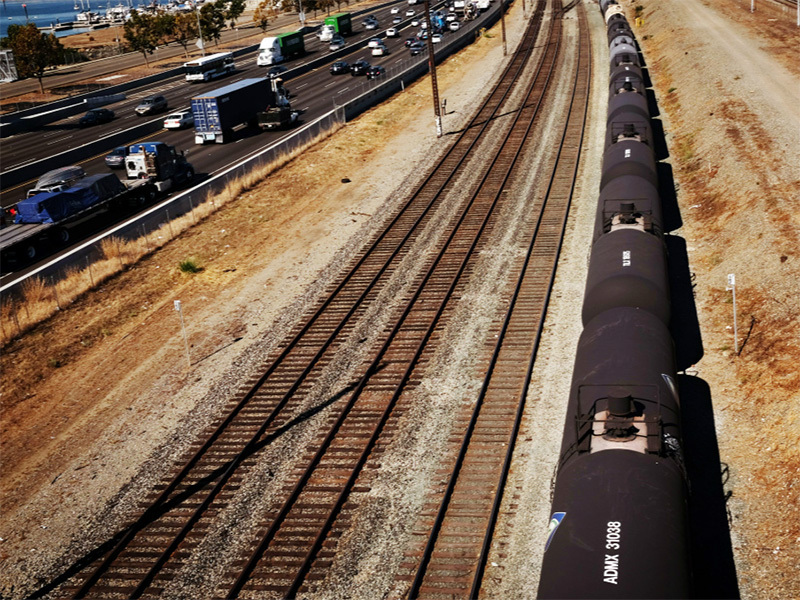 – Tamara ZakimAssociate Attorney, Earthjustice, on a court victory protecting a California law holding railroads responsible for safety plans of hazardous fuels they transport. The Pennsylvania Department of Environmental Protection determined that oil and gas operations damaged state water supplies 209 times between 2008 and 2014. Water supplies have been affected in nearly every region where drilling occurs, with the most instances in Bradford County.